Solar activity is suddenly weakening, and yesterday, Thursday, July 17 the daily sunspot number was zero. We had no other zero sunspot days so far this year, none last year or in 2012, and only two in 2011, on January 27 and August 14. We had 48 days with a sunspot number of zero in 2010 (although Spaceweather.com reports 51 days, and they may be correct), and 260 days with a daily sunspot number of zero in 2009. 2008 had 239 spotless days, and 2007 had 152 days with zero sunspots. Just to revisit the deep trough of solar inactivity we emerged from a few years ago, 2006 had 70 spotless days, 2005 had just 17 days with no spots and 2004 saw only four spotless days. Prior to that we have to look way back to the twentieth century to 1998 to find any spotless days, (three) and 1997 had 57 days with zero sunspots. We have not seen any new sunspot regions emerge since July 10 and 11, when there was a new one each day. On July 8 two new regions appeared. Prior to that we saw a new sunspot region appear each day, from July 1-6. The short term outlook for solar flux shows a flux value of 90 on July 18-21, 95 on July 22-24, then 105, 115, 125, 135 and 140 on July 25-29, 145 on July 30-31, then it peaks at 155 on August 2, then drops to a minimum of 95 again on August 16-17. The same forecast shows planetary A index of 5 on July 18-20, 8 on July 21-22, 5 on July 23, 8 on July 24, 5 on July 25, 8 on July 26, and 5 again on July 27 through August 9. The average daily sunspot number for the recent seven-day reporting period (July 10-16) was only 96.9, down from 205.1 for the previous seven days. The solar flux average was 131.1, down from 193.9 a week ago. OK1HH predicts the geomagnetic field will be quiet on July 18-19, mostly quiet July 20, quiet to active July 21, mostly quiet July 22, quiet to active July 23, mostly quiet July 24, quiet on July 25, mostly quiet July 26, quiet to unsettled July 27, quiet July 28-29, quiet to unsettled July 30-31, quiet on August 1, quiet to active August 2-3, mostly quiet August 4-5, quiet to unsettled August 6-9, quiet to active August 10-11, mostly quiet August 12, and quiet again on August 13. Jon Jones, N0JK, has some interesting comments regarding the question of 6 meter sporadic-E vs F2 layer propagation in recent bulletins. Jon wrote, “Agree it was multi-hop sporadic E, possibly with some chordal Es hops which would reduce signal loss as opposed to F2. Due to seasonal characteristics of the F-layer, F2 is almost impossible on 6 meters in the northern hemisphere during the summer despite high solar fluxes. “EA8DBM did have an amazing signal. I worked Alex on 50.101 MHz July 5 at about 1520z from my mobile in EM28. Solid Q-5 CW signal with a whip and 100 watts. Alex made many 6 meter contacts in North America. Randy Crews, W7TJ, has some interesting observations about Cycle 24 and where we go from here. 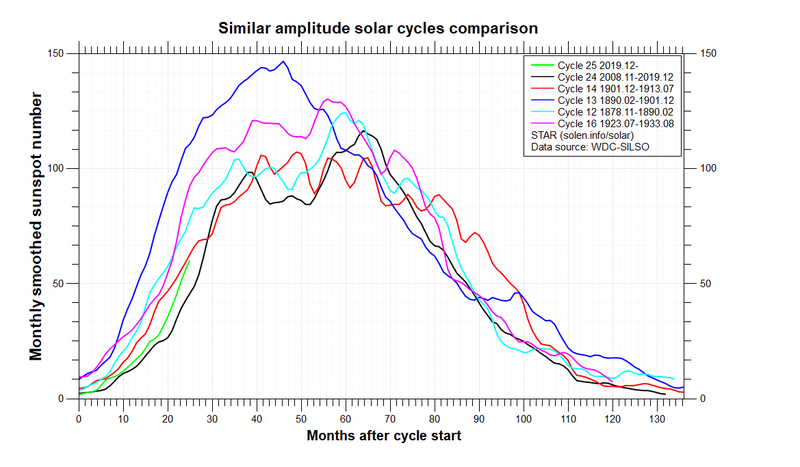 “The page at http://www.stce.be/newsletter/images/2013/19SolarCycleFC2.png clearly shows how Cycle 24 compares relative to other cycles. Note that we are at the 72 Month mark, 6 years into this Cycle. Looking at other cycles, it's easy to see Cycle 24 is reaching the end point as other cycles have done. Additionally, if a cycle starts weak (as Cycle 24 did) it will finish weak - thus far holding true to history. Speaking of starting weak, it took Cycle 24 two and one half years from the bottom in late 2008 until the solar flux climbed above 100 (February, 2011) typically the average time for this to happen is 12 months. This was the first time the solar flux reached 100 since 2005! “This shows a nice bar graph of all cycles up to 24 provided by K9LA. Clusters of high and low cycles trend together in larger macro cycles of 40-50 years. Fitting a trend line to the graph, we are definitely on a downward trend with regard to the big picture, but also the near term outlook. “Cycle 24 had a brief peak in November of 2011, then was flat until October 2013 when the average monthly solar flux steadily climbed month after month, reaching average monthly peak of 170 in February of this year, then declining every month consistently thru June of this year. 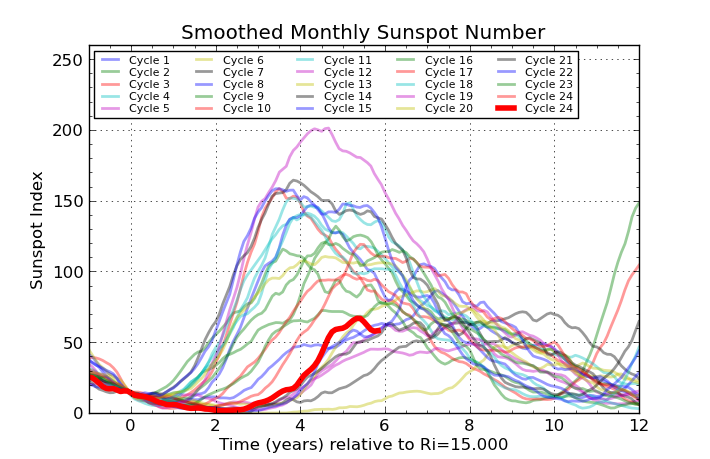 “How much of a bounce back we have in July and subsequent months will really depend on not only the number of monthly sunspots, but also their magnetic size and complexity, which this year has been absolutely key to Cycle 24's second peak, and it's usurping the November 2011 highs. “Conclusion: The peak of this Cycle 24 will go down to be February of 2014 as all the aforementioned data confirms. We may find Cycle 24 giving a last hurrah this fall, but it would be strictly gratis and on borrowed time. “Livingston and Penn have it right. If the size and magnetic strength of sunspots resumes its downward trend, we will indeed have a "Propagation Winter" and Cycle 25 will be even lower. For more information concerning radio propagation, see the ARRL Technical Information Service at http://arrl.org/propagation-of-rf-signals. For an explanation of the numbers used in this bulletin, see http://arrl.org/the-sun-the-earth-the-ionosphere. An archive of past propagation bulletins is at http://arrl.org/w1aw-bulletins-archive-propagation. More good information and tutorials on propagation are at http://k9la.us/. Sunspot numbers for July 10 through 16 were 159, 166, 145, 102, 70, 25, and 11, with a mean of 96.9. 10.7 cm flux was 177.4, 166.3, 145, 126.8, 109.4, 100.6, and 92.1, with a mean of 131.1. Estimated planetary A indices were 8, 6, 6, 5, 9, 7, and 5, with a mean of 6.6. Estimated mid-latitude A indices were 11, 7, 7, 6, 10, 10, and 5, with a mean of 8.